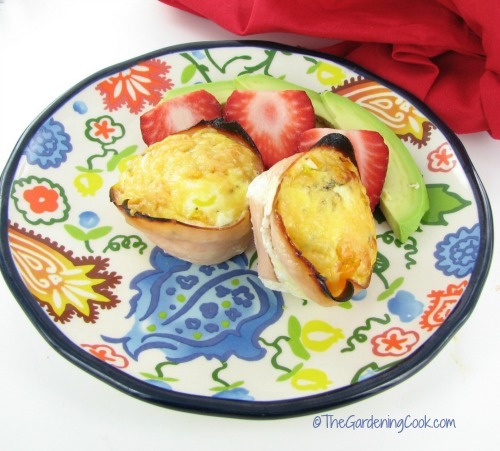 I am always looking for new and interesting ideas for an easy breakfast to start your day. 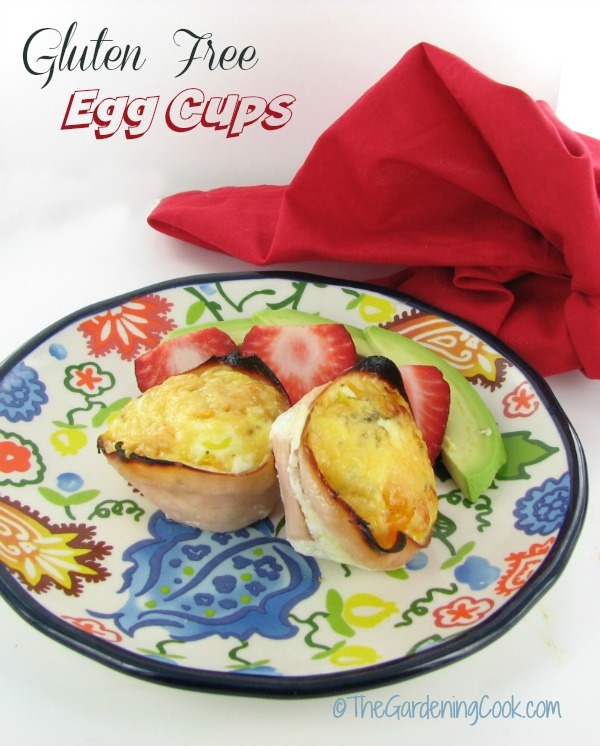 These Gluten Free Egg cups are simple to make, taste great and can be customized for your favorite tastes. 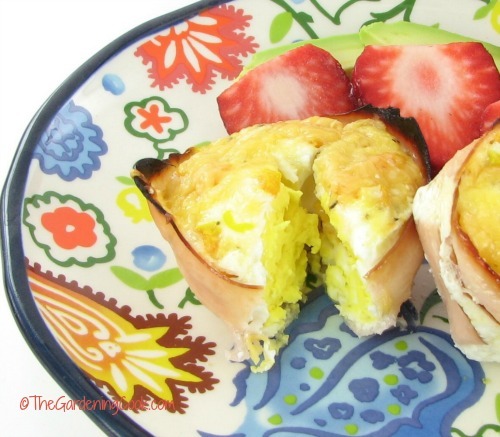 Start Your Day with these Gluten Free Egg Cups. Now add your seasonings. I wanted to experiment with flavors so I added oregano to two wells, tarragon to two, and basil to two, and then sprinkled Kosher salt and cracked black pepper on each. Now come some fillings. Once again, I wanted to see how many tastes I could come up with. Two have chopped mushrooms, three have sweet peppers and one is just plain. The sky is the limit here. Some spinach leaves would work, finely chopped broccoli, whatever you like would work fine. Just be sure it is finely chopped. Now sprinkle on some of your favorite shredded cheese. I chose Beemster, because I had some on hand, but cheddar, mozzarella, Colby Jack or any cheese would work fine. (affiliate link) Pop in a preheated 350º oven for about 25 minutes and you are done. The muffin cups are done when they feel somewhat firm to the touch. 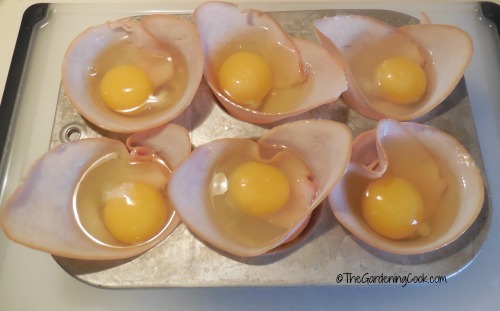 The longer you cook them, the more the yolk will harden. If you like your yolk a bit softer, then 20 minutes should do it. Serve with some fresh fruit and a bit of avocado for a healthy and hearty gluten free breakfast. You can store them in the fridge and then just reheat in the microwave the next morning for about 30 seconds. 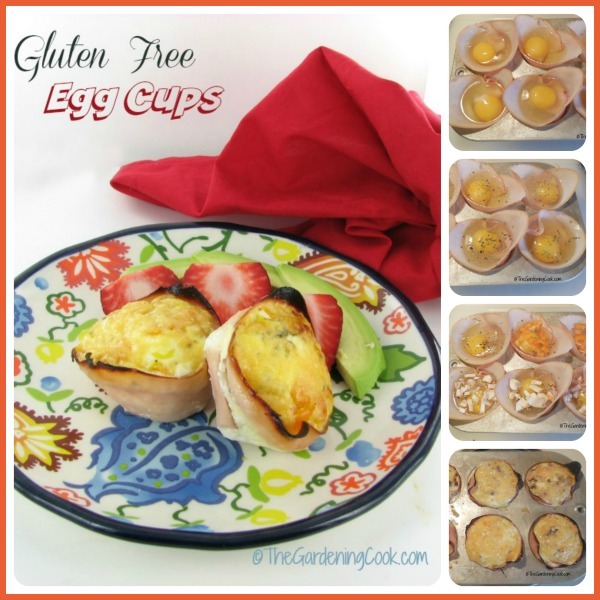 The gluten free egg cups are full of protein, very low in carbs, and also full of vitamins and minerals. How is this for an easy start to you day? So, so, tasty! Who says gluten free cooking has to be boring, or difficult to make? 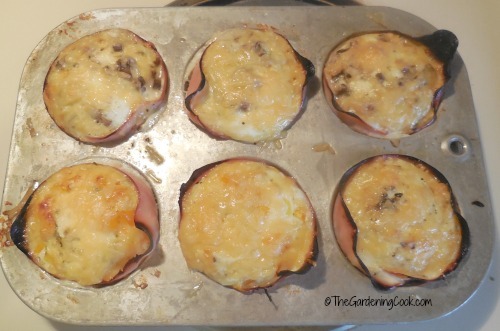 If you enjoyed this post, be sure to check out 35 Foods to cook in a muffin tins. It gives all sorts of ideas, from breakfast to desserts that can be made using muffin tins. For more breakfast ideas, check out these tasty breakfast recipes and be sure to have a look at my gluten free breakfast hash browns. Seasonings of your choice. Basil, tarragon and oregano all work well. Fillings of your choice. Chopped mushrooms, onions, peppers, feta cheese, spinach, etc...all work well. Line each well with a slice of luncheon meat making a cup. 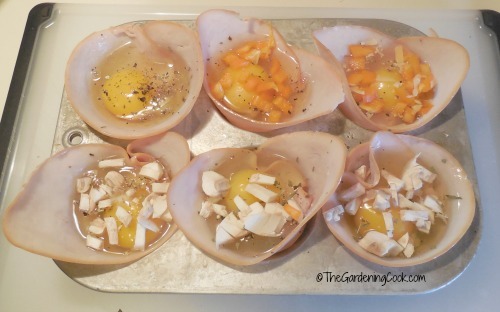 Crack an egg into each up. Season with your seasonings and salt and pepper. Add your fillings and sprinkled with shredded cheese. 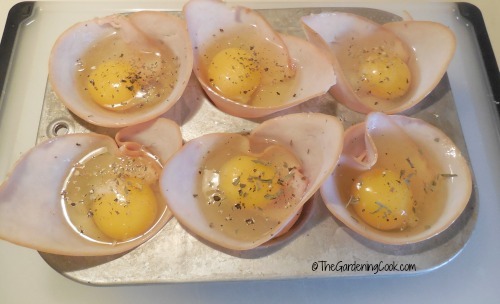 Bake for about 20-25 minutes depending on how hard you like your yolk. Serve with some fresh fruit and slices of avocado. Enjoy!